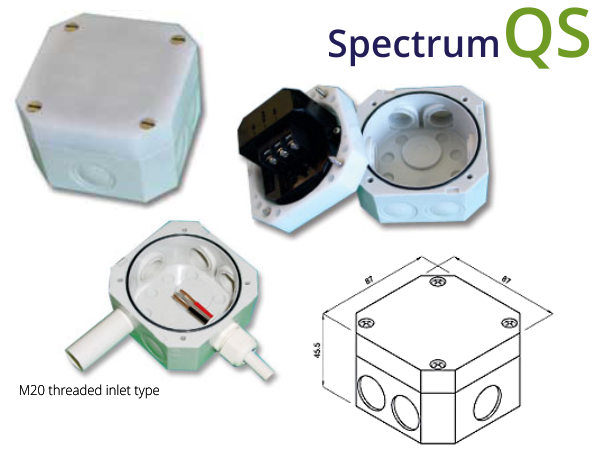 The SPECTRUM QS PECU is very convenient for wall or any other flat surface mounting. No additional junction boxes, strip connectors or brackets are needed. Six side inlets and one rear inlet ensures installation versatility. Side inlets are available in either 25mm non threaded or M20 threaded inlet with re-insertable knock-outs. Versatile and easy to install for wall or any other flat surface mounting.